El-Naggar, A. H., Alzhrani, A. K. R., Ahmad, M., Usman, A. R. A., Mohan, D., Ok, Y. S., and Al-Wabel, M. I. (2016). "Preparation of activated and non-activated carbon from Conocarpus pruning waste as low-cost adsorbent for removal of heavy metal ions from aqueous solution," BioRes. 11(1), 1092-1107. Conocarpus pruning waste, an agricultural byproduct, was converted into low-cost activated and non-activated carbons and used for the remediation of Cd2+, Cu2+, and Pb2+ from aqueous solutions. The carbonization was carried out at 400 °C, while the activation was carried out in the presence of KOH and ZnCl2. Batch single-solute and multi-solute equilibrium and kinetic experiments were carried out to determine the adsorption capacities of the prepared activated and non-activated carbons, and these were further compared with commercially available activated carbon. The results showed that KOH-activated carbon (CK) outperformed the other activated and non-activated carbons in terms of adsorption efficiency. CK removed >50% of the applied Cd2+ and Cu2+ and 100% of Pb2+ at the initial concentration of 40 mg L-1. Interestingly, the performance of Conocarpus-derived non-activated carbon was better than that of the commercial activated carbon, as observed from the Langmuir maximum adsorption capacities of 65.61, 66.12, and 223.05 µmol g-1 for Cd2+, Cu2+, and Pb2+, respectively. The Pb2+ was the metal most easily removed from aqueous solution because of its large ionic radius. The kinetic dynamics were well described by the pseudo-second order and Elovich models. Activated carbon (AC) is the most widely used adsorbent for water purification, desalination, and domestic and industrial wastewater treatment (Babel and Kurniawan 2003). To meet the increasing demands for fresh water, the water purification industry has been rapidly developing throughout the world, and there has been a remarkable increase in the AC price since the early 1990s (Marsh and Rodríguez-Reinoso 2006). It is estimated that the global demand for AC will increase by >10% per annum through 2016 (WAC 2012). Commercial ACs are produced using wood, coal, biomass, and agricultural and industrial wastes (Dias et al. 2007; Kundu et al. 2014). Therefore, there is a need to explore resources for the production of alternatives to the highly priced commercially available ACs. This can be achieved by utilizing locally available agricultural wastes or byproducts. Conocarpus erectus L. is a durable evergreen tree native to North America, the coast of Central America, and tropical Africa (West 1977). Because of its rapid growth and tolerance for drought and negative environmental conditions, it is widespread in Saudi Arabia (Hegazy et al. 2008). Every year huge amounts of Conocarpus waste are either buried in landfills or burned in open fields. Converting Conocarpus pruning waste into AC would offer the dual benefits of reducing green waste disposal and supplying a cheap source of AC production. Generally, carbonization and activation are the two steps involved in producing AC. Activation can be achieved by physical or chemical processes (Chen et al. 2012). Chemical activation is preferred, as the physical activation of carbon requires a long residence time and very high temperatures (800 to 1000 °C), while chemical activation can be achieved at lower temperatures (400 to 800 °C) (Cobb et al. 2012). The simultaneous carbonization and activation in a chemical activation process further reduces the AC production time. A strong acid, strong base, or salt are used for the chemical activation (Soleimani and Kaghazchi 2007). Some of the mechanisms involved in the chemical activation process include the dehydration of the lignocellulosic structure of the parent material, the combination of the chemical agent with the lignocellulosic structure, and the disintegration of the lignocellulosic structure, followed by intercalation and gasification (Marsh and Rodríguez-Reinoso 2006). The salient factors determining the quality of AC include feedstock type, carbonization temperature, duration of process, and activation process (Ng et al. 2003). Industrial activities are increasing exponentially in Saudi Arabia. Despite being a water-scarce country, the demand for water in the industrial sector ranges from 190 to 1,450 million cubic meters per year (Abderrahman 2000). This exponential growth of industrial activities is reflected by the parallel increase in industrial wastewater effluents rich in organic and inorganic pollutants. Therefore, there is an urgent need to treat this industrial wastewater. The reuse of treated wastewater for irrigation purposes has recently shown its potential for managing the increasing demand for water for agriculture production in the Kingdom (Al-Jasser 2011). In this context, low-cost AC production from locally available waste resources, and its application for wastewater treatment, could be a promising solution. In this study, Conocarpus pruning waste was used as a feedstock. Chemical activation was carried out using ZnCl2 and KOH. The efficacy of produced ACs was determined for Cd2+, Cu2+, and Pb2+ adsorption from water. Batch equilibrium and kinetic experiments were conducted to optimize the adsorption conditions. Conocarpus wastes were collected from the King Saud University campus, North West of Riyadh, Saudi Arabia. Woody wastes were dried under direct sunlight until they had reached a moisture content of 4.7±0.7%, and then they were cut into small pieces (2 to 3 cm). The feedstock was further dried in an oven for 24 h at 120 °C. Part of the dried feedstock was impregnated either with ZnCl2 or KOH, in 1:2 and 1:5 ratios (w/w), respectively. The mixtures were then washed with distilled water and kept in an oven for 24 h at 60 °C. The impregnated feedstock was packed in a closed stainless steel container (7 x 11 x 24 cm) and pyrolyzed at 400 °C in a muffle furnace for 2.5 h at the heating rate of 5 °C min-1. The feedstock without chemical impregnation was also pyrolyzed under identical conditions. The pyrolyzed materials were left to cool down in a glass desiccator, ground according to ASTM D4607 (1999), and washed several times with distillated water until the filtrate became Cl– free. The materials were then dried at 105 °C for 24 h and kept in airtight plastic containers at room temperature for further analysis. The obtained ACs were thereafter referred to as CZ (ZnCl2-activated), CK (KOH-activated), and CH (non-activated carbon). A commercial activated carbon (CC) obtained from Sigma-Aldrich (C2889; Saudi Arabia) was also used for comparison. The CC was a multi-purpose activated carbon, made from peat and steam-activated. To measure the moisture contents of the produced activated carbon, 1 g of the materials was heated at 105 °C in an oven for 24 h or until the weight had stabilized. The iodine number was measured and taken as an indication of surface area in accordance with the standard procedure (ASTM D4607 (1999)). The ash content and bulk density were measured according to ASTM D2854 (2009) and ASTM D6683 (2001) standard methods, respectively. The pH of the adsorbents was measured in a 1:25 adsorbent/water ratio using a glass electrode. The surface morphology of the developed carbons was studied using a scanning electron microscope (SEM) (EFI, S50, Inspect, The Netherlands). The samples were mounted onto double-coated adhesive carbon conductive tabs (12 mm, PELCO, UK) and placed onto the aluminum stubs. Images were captured at an acceleration voltage of 20 kV and a magnification of 2000x. All salts (CdCl2, CuCl2, and PbCl2) were obtained from Sigma-Aldrich, Germany. The Cd2+, Cu2+, and Pb2+ stock solutions (1000 mg L-1) were prepared in de-ionized water (Max250, Millipore, France). 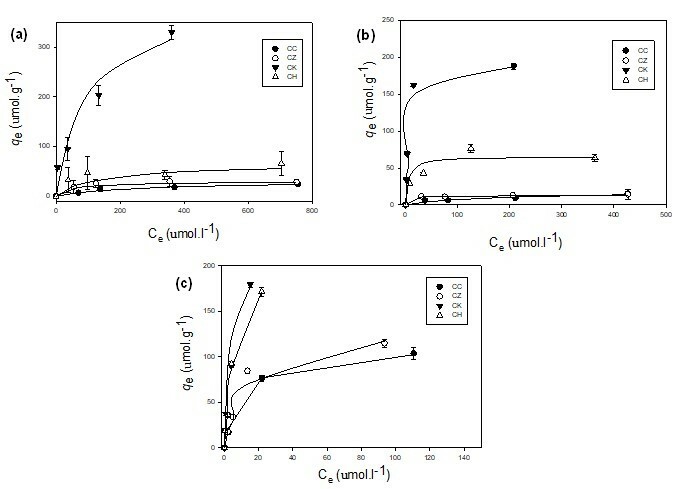 Single-solute working solutions of 0, 5, 10, 25, and 50 mg L-1 concentrations of Cd2+, Cu2+, and Pb2+ were prepared from the stock solutions for the batch adsorption experiments. For each of the three elements, a multiple-solute working solution containing 50 mg L-1 was prepared for the competition study. All the equilibrium and kinetic studies in single and multi-component systems were carried out at the pH of 5.0. The pH of the solutions was also recorded directly after the equilibrium had been achieved. The batch sorption experiments were carried out in a series of stoppered 60-mL cups. For each heavy metal, the concentration range of 0 to 50 mg L-1 was used to obtain the adsorption isotherms. An adsorbent dose of 1.25 g L-1 was applied to 40 mL of the heavy metal ions solution. To reach equilibrium, the mixtures were agitated for 90 min at 25±2 °C using a mechanical orbital shaker (GFL, 3017, Germany) set at 150 rpm. The solutions were then centrifuged at 5000 rpm for 10 min to separate the adsorbents from the solution. The supernatant was then analyzed for its metal content using an inductively coupled plasma optical emission spectrometer (ICP-OES; PerkinElmer Optima 4300 DV, USA). Blanks were also run simultaneously with each batch. Three replicates of each adsorbent and blank were performed. where Qe is the amount of metal adsorbed at equilibrium (mg g-1); Co and Ce are initial and equilibrium aqueous phase concentrations of the metal (mg L-1); M is the weight of the adsorbent (g); and V is the volume of the metal solution (L). where qmax is the maximum adsorption capacity (mg g-1) and b is the Langmuir equilibrium constant (L mg-1). Kf and 1⁄n are Freundlich’s adsorption capacity (mg g-1) and intensity constants, respectively. Parameters of the Langmuir and Freundlich isotherms were calculated by non-linear regression using the calculation of least squares method. 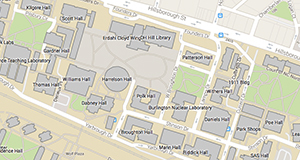 The curve fitting and statistical analyses were performed using SPSS software. The correlation coefficient (R2) and standard error of the estimate (SE) obtained from regression were used for comparing the model applicability. The statistical analyses (one way ANOVA and Tukey test) were conducted using the IBM SPSS Statistics 21 software. The data presented in the tables and figures are the averaged values of three replications, and the bars refer to standard errors. The batch sorption kinetic experiments were carried out to determine the adsorption mechanism. The adsorbents (1.25 g L-1) were added to each heavy metal solution (50 mg L-1). The experiments were conducted in triplicate on an orbital shaker at 150 rpm. Samples were withdrawn at 0, 15, 30, 45, 60, and 90 min, centrifuged at 5000 rpm for 10 min, and the supernatants were analyzed for the final Cu2+, Cd2+, and Pb2+ concentrations using ICP-OES. The kinetic data were simulated using different kinetic models, including the Lagergren pseudo first order model (Eq. 4), the pseudo second order model (Eq. 5), the Elovich model (Eq. 6), and the intraparticle diffusion model (Eq. 7). where qe and qt are the adsorption amounts (mg g-1) at equilibrium and at time t (min), respectively; k1 (min-1) is the pseudo first order rate constant; H0 (mg min-1g-1) is the initial adsorption rate; a is the desorption constant (g mg-1); α is the Elovich initial adsorption rate (mg g-1min-1); and kint is the intraparticle diffusion rate constant (mg g-1min -1/2). The carbonization and activation processes resulted in a mass loss for the Conocarpus feedstock as a result of the removal of volatile materials. This was observed from the yield of ACs ranging from 67.5% to 79.2% (Table 1). The high yield of ACs could be related to the slow carbonization of the feedstock at 400 °C. The low yield of CK (67.5%) relative to CZ (78.0%) could be attributed to the high impregnation ratio of 1:5 (w/w). The bulk density of the CK (0.49 g cm-3) was greater than that of the other ACs, indicating its high filterability and adhering capacity with the adsorbate (Ekpete and Horsfall 2011). The pH values (9.38 to 9.64) indicated that all carbons were alkaline in nature, except for the CZ (pH 6.95). The iodine number is the most important parameter in determining the AC activity. It provides a precise approximation for the surface area and microporosity of AC (Saka 2012). Likewise, chemical activation by ZnCl2 also resulted in an iodine number that was about 1.8 times greater for CZ than for non-activated CH. The treatment of feedstock with ZnCl2 causes “swelling” in the cellulose structure, thus breaking the cellulose molecules and creating micro- and meso-pores (Subha and Namasivayam 2009). The surface structures of the prepared materials were investigated by SEM. The micrographs clearly indicated the differences in the porosities of the structures (Fig. 1). More micro- and meso-pores were observed in CK and CZ than were observed in the CC and CH. These findings were in line with the aforementioned iodine numbers corresponding to these ACs, thereby suggesting their greater microporosity. These diverse characteristics of the prepared ACs may have been responsible for their different adsorption capacities for the Pb2+, Cu2+, and Cd2+ in aqueous solution. Pseudo-first order, pseudo-second order, Elovich, and intraparticle diffusion models were applied to investigate the reaction rates and adsorption mechanisms for the different ACs. 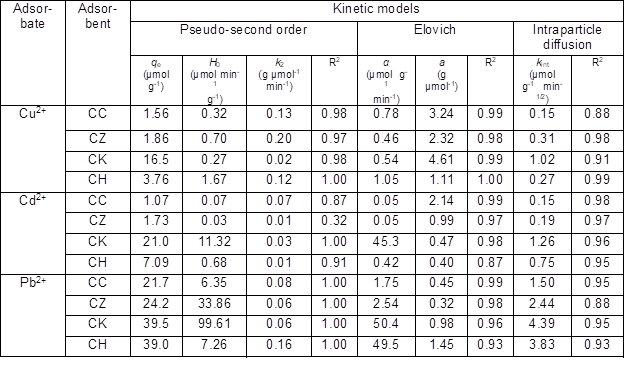 The kinetic parameters calculated using the different models are presented in Table 2. The R2 value is widely used to determine the best fit of the experimental data to the modeled data (Kumar et al. 2008). Based on the R2 values obtained, the pseudo-first order equation did not describe the kinetics data (data not shown); however, all other kinetic models adequately fitted the experimental data (Table 2). The pseudo-second order model best fitted the kinetic data obtained for Cd2+, Cu2+, and Pb2+ on all ACs except for Cd2+ adsorption onto CZ. The adsorption capacity (qe), the initial adsorption rate (H0), and the rate constant (k2) were simultaneously calculated using the model (Table 2). The qe values followed the order CK > CH > CZ > CC for all heavy metal ions, indicating that CK was the most efficient adsorbent in removing Cd2+, Cu2+, and Pb2+ from aqueous media. The k2 values, which determined the time required for each heavy metal to reach equilibrium, ranged from 0.02 to 0.20 g µmol-1min-1 for Cu2+, 0.01 to 0.07 g µmol-1 min-1 for Cd2+, and 0.06 to 0.16 g µmol-1min-1 for Pb2. This indicated that Cd2+ adsorption reached equilibrium more quickly than did Cu2+ and Pb2+ adsorption. The H0 values were higher for the adsorption of Cd2+ onto CK (11.32 µmol min-1 g-1) and Pb2+ onto CK (99.61 µmol min-1 g-1) than for any others showing a high initial adsorption rate. The kinetics adsorption data were also well described by the Elovich model (R2 = 0.87 to 1.00) for all heavy metal ions (Table 2). The Elovich model is widely used to elaborate the adsorption of contaminants based on the heterogeneous surfaces of the sorbents (Plazinski et al. 2009). The initial adsorption rates (α) were in the order CK > CH > CZ > CC for both Cd2+ and Pb2+, and in the order CH > CC > CK > CZ for Cu2+, indicating high Cd2+ and Pb2+ adsorption onto CK and high Cu2+ adsorption onto CH. 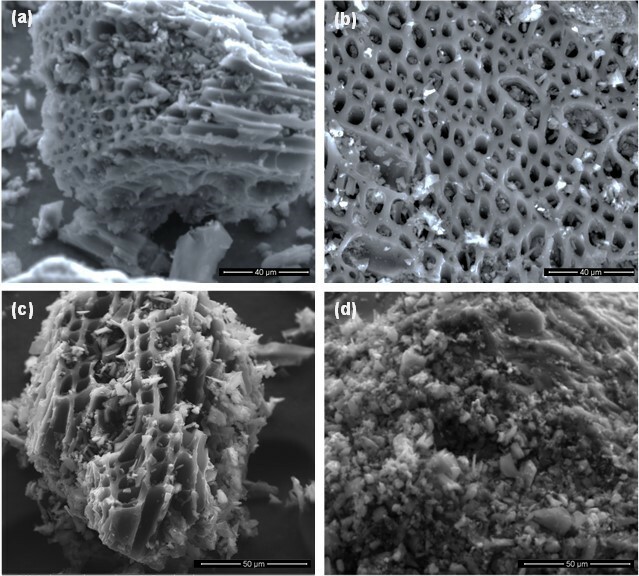 Because of the porous structure of the adsorbents, intraparticle diffusion through micro-, meso-, and macro-pores could be another possible mechanism of Cu2+, Cd2+, and Pb2+ sorption. Therefore, the experimental adsorption data were subjected to an intraparticle diffusion model that provided a good fit of the data as indicated by the R2 values ranging from 0.88 to 0.99 (Table 2, Fig. 2). 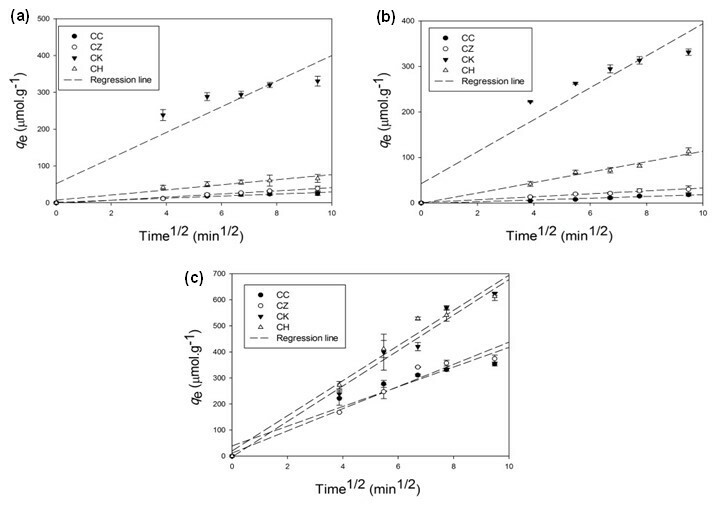 The intraparticle diffusion rate constant (kint) was higher for CK (1.02 µmol g-1 min-1/2 for Cu2+, 1.26 µmol g-1 min-1/2 for Cd2+, and 4.39 µmol g-1 min-1/2 for Pb2+) than for all other adsorbents, suggesting a high metal adsorption rate. The intraparticle diffusion has previously been reported by El-Ashtoukhy et al. (2008) as the rate-limiting step in the batch experiments of Pb2+ and Cu2+ adsorption from aqueous solution using pomegranate peel. The adsorption dynamics revealed that CK was the most favorable choice for Cd2+, Cu2+, and Pb2+ adsorption. This could be attributed to the high activity of CK as indicated by its high iodine number value relative to other carbons. The best fit of the experimental data to the pseudo-second order and Elovich model predicted that chemisorption may be the dominating mechanism responsible for Cd2+, Cu2+, and Pb2+ adsorption onto different carbons. A model of chemisorption assumes that the adsorption is a multilayer occurrence in which each layer exhibits different activation energies (Alberti et al. 2012). Furthermore, the diffusion of heavy metal ions into the pores of the tested adsorbents could be another plausible mechanism of Cd2+, Cu2+, and Pb2+ adsorption, as indicated by the good fitness of the experimental data to the intraparticle diffusion model. Specifically, the high adsorption rates for CK and CH could be due to their micro-porous structures, as can be observed from the SEM micrographs (Fig. 1). The Langmuir and Freundlich isotherm models were used to investigate the equilibrium relationships between the metals adsorbed onto different carbons and the metal equilibrium concentrations in solution at constant temperature. Non-linearized isotherm models were employed to avoid the error variance violation caused by linearized forms (Ho et al. 2002). The adsorption isotherm constants are presented in Table 3. The Langmuir adsorption isotherms obtained for the various sorbents are shown in Fig. 3. The Langmuir adsorption capacities (qmax) for Cd2+ and Cu2+ followed the order CK > CH > CC > CZ, while for Pb2+, the adsorption capacities follow the order CH > CK > CZ > CC. The high adsorption capacities of CK and CH were also evidenced from their high binding energies (b values; Table 3). The extremely high qmax values that were obtained for CK (191.3 µmol g-1 for Cd2+, 213.1 µmol g-1 for Pb2+, and 399.17 µmol g-1 for Cu2+) indicated a high adsorption capacity of CK due to its high iodine number (1126; Table 1), and also suggested that it had a high surface area relative to other carbons. The 1/n values of the Freundlich model were less than 1 for all sorbents, indicating a downward-curved isotherm in which the sorption of metals decreased with increases in the surface loading of the adsorbent (Site 2001). Overall, the adsorption data were better described by the Langmuir isotherm equation (R2 = 0.84 to 0.99) than the Freundlich isotherm equation (R2 = 0.76 to 0.98), indicating the monolayer adsorption of the heavy metal ions onto the carbon surfaces. The high adsorption capacity of CK as predicted by the Langmuir model was in agreement with the predictions of the pseudo-second order model for the kinetics adsorption data (Table 2). Among the different heavy metal ions, Pb2+ showed the highest adsorption affinity onto the different carbons, which could be due to its larger ionic radius (0.118) relative to Cd2+ (0.097) and Cu2+ (0.073) (Ahmad et al. 2012). The non-activated CH had a higher adsorption capacity than CZ and CC for Cd2+, Cu2+, and Pb2+. The incomplete carbonization at low temperature (400 °C) without chemical impregnation may have resulted in the persistence of non-carbonized materials in the CH, where partitioning could be the main adsorption mechanism (Chen et al. 2008). Another implication is that CH contains different functional groups, including carbonyl (C=O), carboxyl (-COOH), and hydroxyl (-OH) (Al-Wabel et al. 2013) that may contribute to metal complexation (Ahmad et al. 2014). Therefore, it may be speculated that the high adsorption capacity of non-activated CH may be due to various mechanisms, including adsorption, partitioning, complexation, and pore diffusion. Sorption capacity of CK was compared with other studies using different precursors and similar activation process (i.e. impregnation with KOH) (Table 4). For all heavy metal ions (Cd2+, Cu2+, and Pb2+), the sorption capacity of CK was better or comparable with other reported literature. Therefore, activated carbon produced from the Conocarpus pruning waste could be a cost effective alternative sorbent for the removal of heavy metal ions from aqueous media. The percentage removed of Cd2+, Cu2+, and Pb2+ from water by various ACs is shown in Fig. 4. At low initial metal concentrations, the removal was high, but then gradually decreased with increasing metal concentrations. The CK was most efficient in removing Cu2+ and Cd2+, while CK and CH removed equal percentages of Pb2+ from aqueous solutions at all the initial concentrations. The CK was capable of removing >85% and >50% of Cd2+, Cu2+, and Pb2+ contents at the initial concentrations of 4 mg L-1 and 40 mg L-1, respectively. The decrease in removal efficiency was due to the insufficient availability of binding sites at higher metal concentrations. Generally, it is believed that the adsorption of heavy metal ions on carbons is site-specific (Usman 2008). With the surface loading of metals increasing, fewer sites were available to adsorb more quantities of metal in the solution. 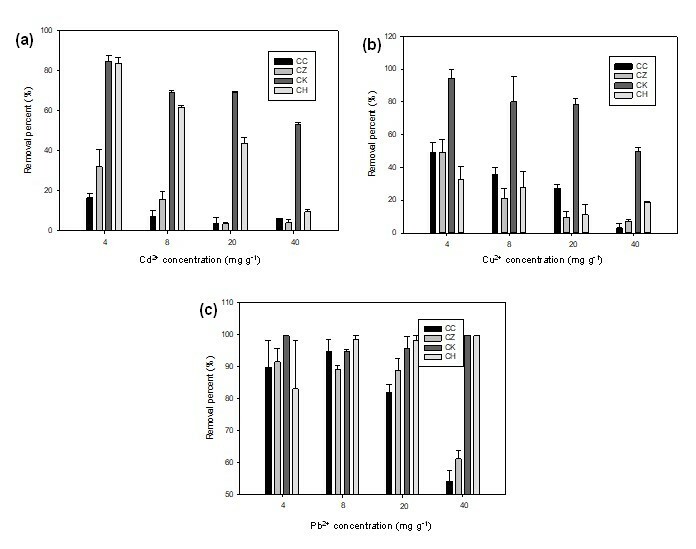 To account for the more realistic contamination of water with multiple elements, the competitive effects of Cd2+, Cu2+, and Pb2+ on their adsorption onto different adsorbents were investigated, and the results are presented in Fig. 5. In a single-solute adsorption experiment at an initial metal concentration of 50 mg L-1, maximum adsorption was obtained for Pb2+, followed by Cu2+ and/or Cd2+ except onto CK. Greater sorption of Cu2+ onto CK could be attributed to high affinity of Cu2+ to form Cu(OH)2 than Pb2+ and Cd2+ as determined from their solubility products (Ksp Cu(OH)2 = 1 x 10-20, Ksp Pb(OH)2 = 2.5 x 10-16, and Ksp Cd(OH)2 = 3.2 x 10-14) (Gonzalez et al. 2015). However, in a multi-solute adsorption experiment at the same initial metal concentration, a reduction in the adsorbed amount of each heavy metal was recorded, thereby indicating a possible competition among Cd2+, Cu2+, and Pb2+ for the available adsorption sites. Additionally, Cu2+ showed maximum adsorption onto all adsorbents in the mixed metals solution, which contradicted its behavior in the single metal solutions, where Pb2+ was generally the dominantly adsorbed metal ion onto CC, CZ and CH. The dynamics of the competition between different metals for the available adsorption sites were driven by metal properties such as ionic radius, atomic weight, hydrolysis constant, electronegativity and Misono softness values (Ahmad et al. 2012). Moreover, the heterogeneity, pore size distribution, and hydrophobicity of the carbons also had vital impacts on the contaminant sorption in a multi-solute system (Li et al. 2002; Pagnanelli et al. 2005). The relative sorption selectivities of Pb2+, Cu2+, and Cd2+ by the investigated sorbents were determined, and the results are depicted in Table 5. The three investigated metals were arranged according to their adsorption capacity (µmol g-1) in the following relative sequences: Cu2+ > Cd2+ ≥ Pb2+ for CC; Cu2+ > Cd2+ > Pb2+ for CZ; Cu2+ > Pb2+ > Cd2+ for CK; Cu2+ > Cd2+ ≥ Pb2+ for CH. The predicted order of heavy metal ions based on their properties is also shown in Table 5. It was observed that the variations in the order of the sorption capacities were dependent on the properties of both metal and the adsorbents. The order for the adsorption of heavy metal ions onto CK was correlated with the relative electronegativity of the metals and metals hydroxide (M(OH)2) solubility product constants. Moreover, the adsorption preferences presented by CC, CK and CH for Cu2+ over the other two metals may be explained by its high electronegativity and lower ionic radius. The metal affinity order of the CK could be expected based on the fact that the metal retention is dependent on MOH+ adsorption, and is more strongly adsorbed than the free metal. Additionally, the heavy metal ions can also be precipitated as M(OH)2. Therefore, the hydrolyzed metal forms may have been the main factor affecting metal adsorption and/or precipitation onto CK. Generally, the results suggested that the adsorption preferences exhibited by CK for Pb2+ over the other two heavy metal ions may be explained by this heavy metal’s relatively high pK1, atomic weight, and softness. Conocarpus pruning waste was converted to activated and non-activated carbon. These carbons were characterized and utilized as adsorbents for aqueous Cd2+, Cu2+, and Pb2+. The Langmuir model predicted the highest adsorption capacity of the Conocarpus-derived KOH-activated carbon for the removal of heavy metal ions. The adsorption dynamics were adequately described by the pseudo-second order, Elovich, and intraparticle diffusion models. The competition for active sites available on carbon was observed in the multi-solute system. Interestingly, the non-activated carbon derived from Conocarpus waste performed better than the commercially available activated carbon. It is therefore recommended that Conocarpus waste be successfully converted into an efficient and low-cost carbon for the purification of metal-contaminated water. The authors extend their appreciation to the Deanship of Scientific Research, King Saud University for funding this work through the international research group project IRG-14-14. Abderrahman, W. A. (2000). “Urban water management in developing arid countries,” Water Res. Develop. 17, 247-255. Aimi, A. W. N., Norain, I., Aziyah, N. B., Izza, N. H., Vicinisvarri, I., and Hakim, M. H. (2014). “Utilization of base modified oil palm fiber for removal of Cd(II) from aqueous solution,” Res. J. Chem. Environ. 18(5), 26-32. Cobb, A., Warms, M., Maurer, E. P., and Chiesa, S. (2012). “Low-tech coconut shell activated charcoal production,” Int. J. Serv. Learn. Eng. 7(1), 93-104. Haris, M. R. H. M., Wahab, N. A. A., Reng, C. W., Azahari, B., and Sathasivam, K. (2011). “The sorption of Cd(II) ions on mercerized rice husk and activated carbon,” Turk. J. Chem. 35, 939-950. Marsh, H., and Rodríguez-Reinoso, F. (2006). Activated Carbon, Elsevier Science, Oxford. Prapagdee, S., Piyatiratitivorakul, S., and Petsom, A. (2014). “Activation of cassava stem biochar by physico-chemical method for stimulating cadmium removal efficiency from aqueous solution,” Environ. Asia 7(2), 60-69. WAC (2012). “World activated carbon,” Study #2878, The Freedonia Group, Cleveland, OH. West, R. C. (1977). “Tidal salt marsh and mangal formations of Middle and South America,” in: Ecosystems of the World. 1. West Coastal Ecosystems, V. J. Chapman (ed. ), Elsevier, Amsterdam, pp. 193-213. Article submitted: June 26, 2015; Peer review completed: September 6, 2015; Revised version received: Sept. 18, 2015; Further revisions and acceptance: November 6, 2015; Published: December 9, 2015.